The article highlights and expounds on the opinions of the curator of the Klaus Wachsmann archive, ethnomusicologist Sylvia Nannyonga-Tamusuza on the subjects: cultural destiny, politics of music, and the purpose of archiving. 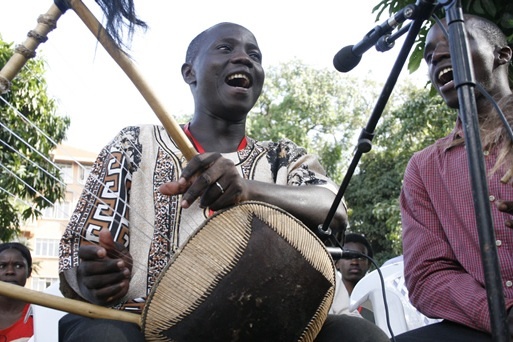 It is often said that African culture is very poorly recorded. This is partly attributed to the fact that documentation of music, poetry and other intellectual forms of art and culture is first and foremost to memory. From the opening of Klaus Wachsmann Music Archive at Makerere University. In my previous article ‘Nawani: A Sensitive Karamojong’ I discovered a brilliantly absurd lack of awareness about the culture of the Karamojong, when a number of people I interviewed for the article remarked that they did not know that the Karamojong sang at all. “Do they really sing?” was a common response to my inquiries. This was in part because available documentation about Karamojong poetry and music, is generally very poorly disseminated, even in Uganda. This attitude is not something unique to Karamojong culture and music, but most Ugandan forms of art and culture of a traditional nature. 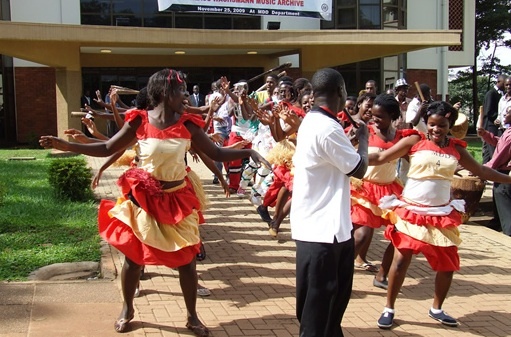 One of the main objectives of the Klaus Wachsmann Music Archive, located within the Makerere University Library, is to provide study materials to any amateur or serious scholar of the music and dance of Uganda. The brochure reads as objective number 4: To research on and disseminate Ugandan music and dance through print and online publications, workshops, exhibitions and conferences and community outreach. “My hope is to create materials for secondary schools from the archive. In that way, (students) can be able to remember and to understand what was there before. And we would work with UNEB because it is in the curriculum that they need to have prescribed works. With the recordings, we can give (students) some background and some context; they would be able to understand and go find out more by themselves. 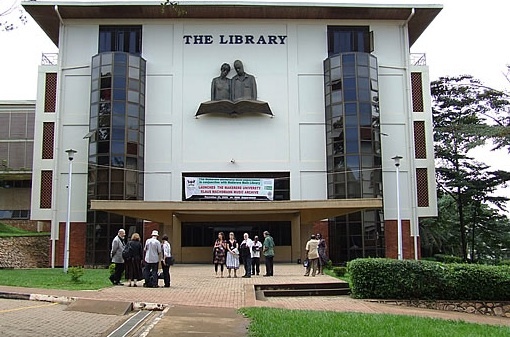 One other thing we’ve done is introduced ‘Archiving’ as a course one can offer here at (Makerere) University, and would enable the students to access the archive. The music being referred to as materials is indeed no small thing to decipher. For example, the archive has complete recordings of Embalu, season of manhood, in the year 2010, which includes music ensembles, group singing and other activities. 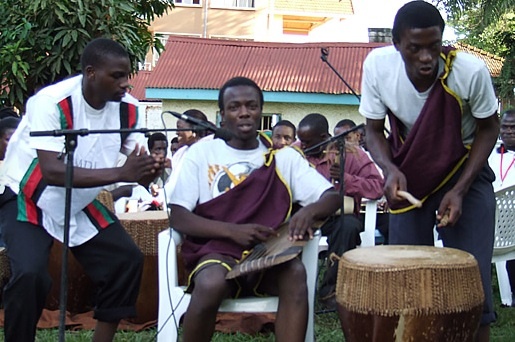 As a reviewer of Ugandan contemporary music, finding a point of reference to critique this music is extremely difficult, because of its context. First, the language is difficult to decipher. Then, the instrumentation is many times odd and no longer fashionable. Though storytelling from the recordings is easier to understand, it is equally daunting to identify the contextualization of characters or how they relate to stories deeply woven in traditional folk wisdom. It requires a specialist approach like Dominic’s thesis to help people understand what this music is really about. 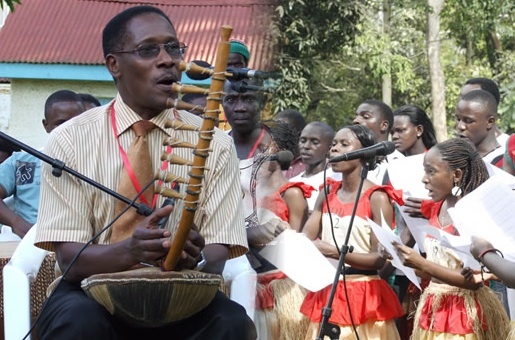 The accurate contextualization and theoretical analyses that come from research writing such as in the case of Dominic and other amateur or professional ethnomusicologists is crucial to discovery, epiphany and discovery in the forum of cultural dialogue in Uganda. If some of this research can get onto the radio, television, newspapers and history books, then people can begin to speak of a certain musician or kind of music as an integral part of history of this country. “My thinking is that a culture that doesn’t have a history is a dead one,” Dr. Sylvia says. “Wachsmann came to Uganda in 1927. He was here for 20 years, and he left in 1957. He initially came in as a missionary. He was German. He came from Germany during the war and went to Britain where he got some kind of asylum, and that’s why he came (to Uganda) through them. He had studied musicology and was working on his doctorate. He came with the missionaries when he came here. He first worked in Namirembe, and was teaching music there around that time. After that he was eventually taken in by the government, becoming the first curator of the Uganda museum. While there he collected a lot of musical instruments. As a missionary he had contacts from the people in the villages, thus was able to move around. I had a chance to look at some letters he had sent to officials in the villages to ask them to send him musical instruments,” Dr. Sylvia explains. 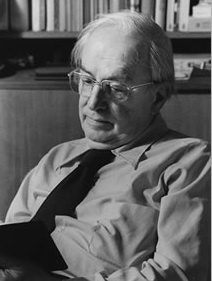 Wachsmann was not a professional archivist, and the person who actually recorded much of the music available in the archive was a professional sound engineer who had received a grant to assist Wachsmann in his musical research in Uganda. This yielded the great quality of recordings available in the archive. The archiving process at the time involved the use of reel-to-reel tape; equipment was unavailable in the 1960s to play the tapes at the Uganda Museum where Wachsmann had stored them. When the tapes were repatriated by the UCLA archive, when Klaus Wachsmann was invited to teach there, and a flood unfortunately destroyed them, the gentleman who recorded the music offered up copies he had made and kept aside. I was marveled by the idea that at his home in England and at UCLA in Los Angeles, America and at the Uganda Museum in Kampala were these different copies of the entire collection by Klaus Wachsmann. In my opinion, this is the true meaning of archiving, where even when dealing with an easily destructible medium like reel-to-reel tape, by forces such as uncontrolled temperatures, direct sunlight or the flood that hit UCLA’s basement archive, the archivist ensures the continuity of the information. Dr. Sylvia has been collaborating with the archive at UCLA to equip the staff at Makerere’s Wachsmann Archive with tools and skills like digitization of DAT and reel-to-reel tape, and operating the equipment that allows playback of these mediums. A course is available in Archiving at Makerere University. Archiving technology however, is not the only challenge which the archive has faced. The politics of music are another one, and by that we refer to the promoters’ rights, advertising rights, promotional rights on radio, the National Budget (how much it allocates to music and under which government ministry music belongs to), as well as parent’s attitude towards their children’s interest in a music career. “Politics is a part of life; we are all living in a political world. And music, in this case, is a product of human behavior where politics is part of it. And whatever we experience, whatever we are going through when we begin to create music, it doesn’t come from the skies; it’s what we are experiencing. In fact we are telling a story, but speaking it differently, so music and politics or music and culture, it is part and parcel. Because politics affects culture, and also culture affects politics,” Dr. Sylvia explains. Culture is a loaded term, but the quote above shows the level of political influence in music, yet the Ministry of Education has lately threatened to scrap music and fine art off the Ordinary level syllabus. But there are also aspects of politics in music that can be traced to the way parents react to their children’s interest in pursuing musical careers. Many musicians have experienced being mistreated by family members for showing interest in music. The music producers are also part of this politics because they have taken advantage of the despair that musicians in Uganda face on an everyday basis. When Sylvia grew up, her mother never wanted her to play music because (female) musicians were considered to be “prostitutes”. She describes a particular scenario where once her mother came back home to find a young Sylvia dancing baakisimba instead of washing the dishes, and she was lashed with strokes of omuzingoonyo (banana leaf stem). But even this did not deter Sylvia from her passion for music, which she went on to pursue at Makerere College School playing clarinet and excelling at dance. Such an attitude can be attributed to politics of music and the lack of music appreciation within a society that still finds it difficult to accept music as a lucrative career, thinking whoever joins it will remain dependent on family members and handouts. The archive would be crucial in generating dialogue, discourse and interest in Ugandan music itself. Already it has reached out to the descendants, the children and grandchildren of some of the musicians on record in Adjumani and Moyo for example, where the archive staff took back the music, playing it back to audiences who shouted and hollered in excitement at hearing the voice of their grandparents and historically celebrated musicians. The staff also took back CDs and cassettes and also worked on an article about the experience that was published in an international journal of musicology which proved that “the indigenous people are now in charge of their cultural destiny”. What does it mean for the indigenous to be in charge of cultural destiny? This means that we, in Uganda, are responsible for documenting, studying and understanding the musical heritage that is available. Many contemporary musicians are looking for avenues to make their work more authentic. Those who tour the international cities of Paris and New York, realize that cultural heritage is appreciated in the music of Geoffrey Oryema for example, whose music borrows extensively from Luo traditional musical forms and the adungu instrument. The Wachsmann Archive would be the perfect place to establish more accurate study by those same musicians who are searching for ‘authenticity’ to research on various instrument, and to hear recordings of the canons of master players in Uganda’s cultural legacy. Sylvia Nannyonga-Tamusuza is currently part of Startjournal.org’s Editorial Board. 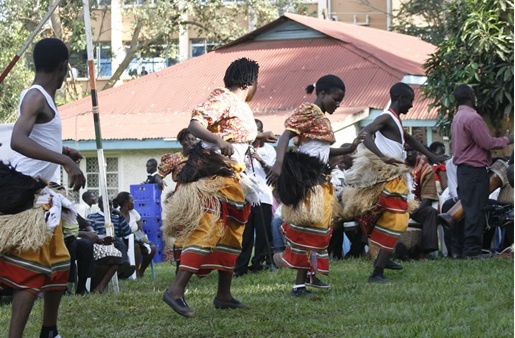 All photos by courtesy of Makerere University website. For further information, click here. Also, visit British Library for sound samples.